The BH Fitness Global Multi Gym offers the complete range of exercise stations you need to effectively work all major muscle groups. With some clever design ideas and an intricate pulley system this product article will take a look at just what you get for your money, as well as making comparisons with similarly priced multi gyms. Possibly the most popular feature on multi gyms is the chest press. Together with the biceps, the chest is often the muscle group people most want to develop. 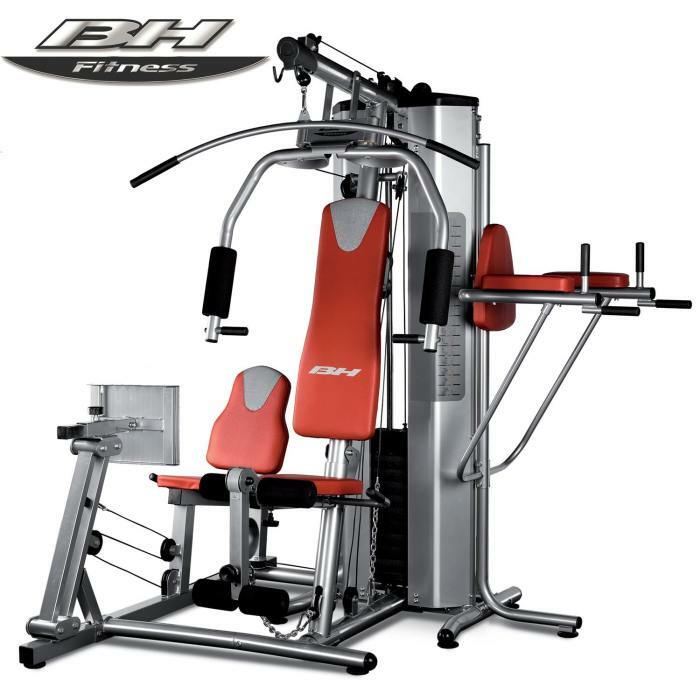 The BH Fitness Global Multi Gym has been designed with a pair of chest press arms that can be used for both the main chest press exercise and for pec flyes. The chest press is mainly for overall chest development, while the pec flyes will isolate more of the inner chest. Although the high cable pulley is often associated with lat pulldowns, you can really use this for almost any exercise. The 100kg resistance limit will be more than enough for exercises such as tricep pushdowns or seated ab crunches with the lat bar lowered to behind your shoulders. 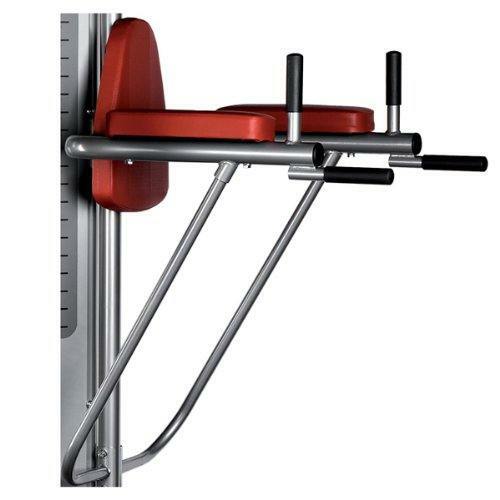 The rounded design of the lat pulldown bar will also help to contract your inner back muscles more at the lower portion of the movement to prevent overdeveloping your outer back muscles. 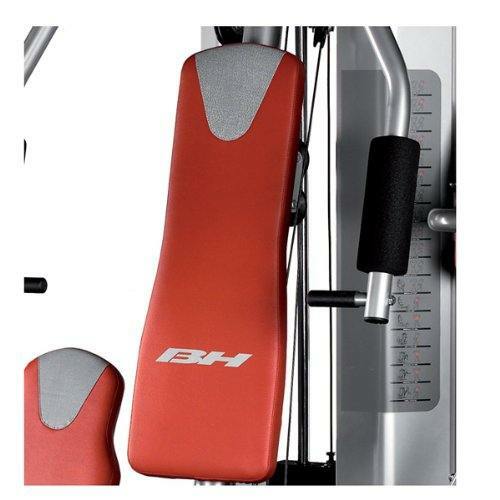 One of the clever design features with the BH Fitness Global Multi Gym is how the low cable pulley has been designed. Whereas many multi gyms just have the cable running straight through the leg developer, losing the benefits of a low cable pulley for exercises such as bicep curls, the cable on this design just clips onto the back of the leg developer. This means that when you want to perform leg extensions or hamstring curls you can just attach the cantilever clip onto the leg developer and continue your leg workout. If you want to keep the leg developer out of the way while you perform exercises such as upright rows or cable bicep curls using a low cable attachment then you can. Simply unclip the chain, fold the seat and leg developer out of the way and clip the chain onto your cable attachment. While most leg developer attachments come as a fixed length, the design of the BH Fitness Global Multi Gym means you can adjust the length of the main leg developer section. Having a handle either side of the seat also helps keep you seated when performing leg extensions with heavier weights. This is crucial for taller users or anyone that wants more control over where the padded roller rests on their calf during standing single hamstring curls. The most complete home-use training station. 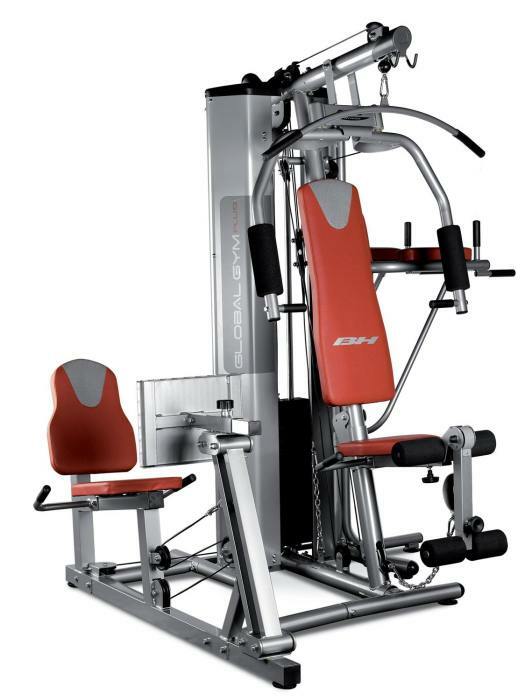 Combines a multi-station with a seated leg press and abdominal flexor with dip bars. 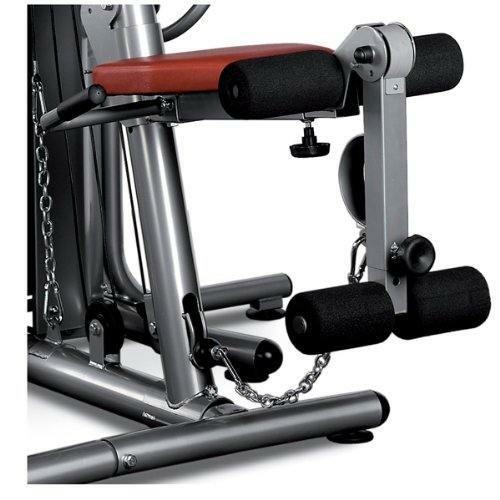 Adjustable seated leg press with holding grips. Maximum comfort and protection while training. Foldable seat. Greater protection and safety whilst exercising, controlled exercise. Thanks to its exclusive guided work system, exercise can be done with maximum security. Exercise control with a maximum tension of 100Kg / 221 lbs, Ample weight for progressive training. Pulley system with bearings, provides a very smooth and direct exercise. While multi gyms have conventionally been kept separate from pull up and dip stations, it is becoming increasingly common for the two to be seen on the same piece of exercise equipment. This will benefit your training in two main ways. Firstly you have a greater range of exercises for upper body development such as dips and leg raises to target your abdominals and core. Secondly, the fact that you can now add bodyweight exercises to your workout. To prevent any movement in the dip bars, additional frame supports have been added which join to the main frame. Bodyweight exercises such as dips have some major benefits over cable exercises alone due to including a lot more ‘stabilizer’ muscles, as well as more major muscle groups. As well as the set of handles for dips, there is also a second set which can be useful to hold onto when performing leg raises. The back rest and arm supports are well padded to prevent any discomfort during the exercise and the handles feature a special coating to help improve your grip. In a similar way to how the Tunturi leg press has been designed, because the cable pulley system flows so smoothly through the frame you only need the one weight stack. With your legs being such a large muscle group it’s important to combine compound mass building movements with isolation exercises to fully develop the muscles. Having the 100kg weight stack ensures that even experienced weightlifters can develop a workout on the BH Fitness Global Multi Gym that will prove effective. 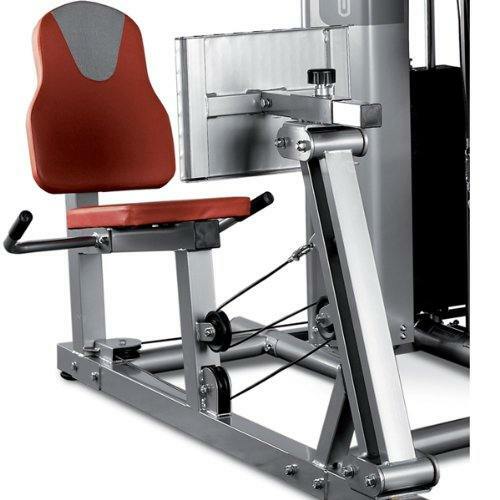 To take into account different user heights, the distance the leg press plate is away from the seat is adjustable using the hand wheel just behind the plate. To help prevent your body from rising up in the seat when using heavy weight, a handle has been added on each side of the seat. By keeping your position in the seat fixed this also helps drive more power through your legs into the foot plate to help get those last couple of repetitions. There are a few other nice touches that won’t necessarily make a difference to your training but are useful, such as the feet positioned at key points on the base of the frame to raise it up slightly and help protect your floor. The BH Fitness Global Multi Gym offers a surprisingly wide range of exercise stations for the price. The FINNLO Autark 2500 Multi Gym is probably the closest in terms of having a leg press available with a similar maximum resistance, but even this requires an upgrade to the full 100kg and has a lower user weight limit of 120kg compared to 130kg with this multi gym from BH Fitness. The amount of custom adjustments that can be made to the leg developer, leg press and even the foldable seat ensure that the widest range of user heights and body types are catered for. A well designed, high quality multi gym that keeps the space it takes up to a minimum and keeps you safer in your workouts thanks to the protected weight stack.